Theological Reflections on Natural Family Planning – Joseph W. Koterski, S.J. Toward an Understanding of Fruitfulness – Antonio López, F.S.C.B. Light in Darkness: Hans Urs von Balthasar and the Catholic Doctrine of Christ’s Descent into Hell by Alyssa Lyra Pitstick – Bernhard Blankenhorn, O.P. 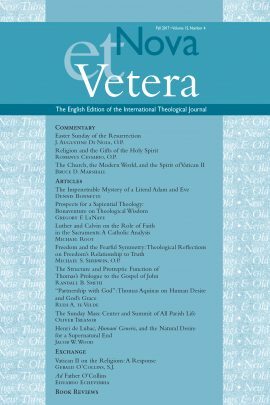 Resilience and the Virtue of Fortitude: Aquinas in Dialogue with the Psychosocial Sciences by Craig Steven Titus – Basil Cole, O.P. God’s Universe by Owen Gingerich and Chance or Purpose? Creation, Evolution, and a Rational Faith by Christoph Cardinal Schönborn, O.P. – Edward T. Oakes, S.J. Be the first to review “Nova et Vetera, Fall 2008 (Vol. 6, No. 4)” Click here to cancel reply.